Granberg is currently the director of the Utah Automated Geographic Reference Center (AGRC), a position he has held since September 2012. Originally, the Columbia, Missouri, native was not headed for a career in either public service or GIS. He received a bachelor’s degree in political science from Carleton College in Northfield, Minnesota, where he specialized in technology and public policy. Although Granberg didn’t want to leave Utah, he still wanted to go to graduate school. A master’s level certificate in urban planning offered by the geography department at University of Utah seemed aligned with his interests. However, once at the university, Harvey Miller, one of the department’s professors, convinced Granberg to pursue a degree in GIS instead. He did, and in 2000 he received a master’s degree in GIS. While completing that degree, he worked as a GIS programmer/analyst at the University of Utah DIGIT Lab, becoming its interim director upon his graduation. Granberg then left the university to join AGRC, where he became the manager of the State Geographic Information Database (SGID) for the next 11 years. AGRC is a division of the Utah Department of Technology Services (DTS). It has about a dozen full-time staff members who work on application development, facilitate local and state GIS coordination, operate a GPS base station network, and—most important—maintain SGID. It has a hybrid business model. Part of its budget comes from general funds, and part is generated by offering desired services through interagency agreements and grant programs. Established in 1984 by Utah’s farsighted lawmakers, based on a belief that location and spatial relationships are of fundamental value in serving the state, AGRC has been working to eliminate information silos in government for more than 30 years. With SGID, AGRC has created and carefully curates one of the most outstanding repositories of geographic information in the nation. This one-stop resource for Utah’s geoinformation is free and accessed by users worldwide. In addition to agency contributions, AGRC has partnered with agencies and institutions across the state and the nation. Participation by all state agencies in populating SGID was codified into state law in 1991. 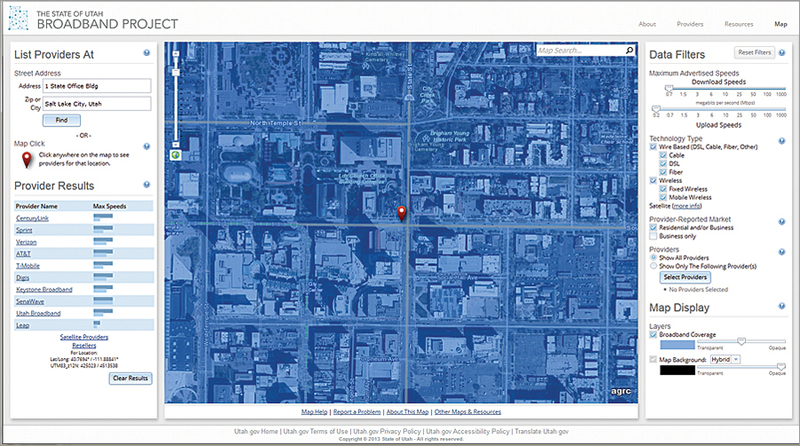 AGRC uses geographic information to improve service to Utah residents. This web app lets residents find out which broadband providers are available in their neighborhood. AGRC, an early adopter of Esri technology, was among Esri’s first 100 customers. 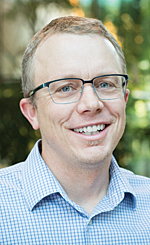 Granberg, too, has been using Esri products for a long time, starting in graduate school when the software was just transitioning from command line-based ARC/INFO to GUI-based ArcView GIS. Thanks to his ARC/INFO experience, Granberg received a solid grounding in command line, digitizing, and pen-plotters. He is also thankful for “the view under the hood of GIS design that I got from learning and using Avenue and later ArcObjects.” Both gave him a fundamental understanding of the technology. That understanding of GIS has helped him see opportunities for expanding the technology across the enterprise. Of the many projects he has been involved in while at AGRC, Granberg is very pleased with the benefits accrued from projects that leverage the connectivity of the web. The clearinghouse websites at gis.utah.gov have been successful in providing access to data as well as news and software tips. AGRC’s web services, the geocoding API, basemap services, and spatial query API at api.mapserv.utah.gov “leverage Esri technology but allow others to benefit without having a specific technology stack or knowing the details and formality of GIS web services,” Granberg noted. “To the extent that I am associated with Utah’s success, I really have to credit the folks who laid the foundation, including my predecessor Dennis Goreham and the perennial leaders of the Utah Geographic Information Council, including Kevin Sato, Nick Kryger, Dave Henrie, and Don Wood who also represent the commitment to GIS made across city and county government in Utah,” noted Granberg. Throughout his career, he has been actively supporting more intelligent use of geospatial information on state and national levels. He is currently a member of the National Geospatial Advisory Committee and has been a board member of the National States Geographic Information Council (NSGIC) for more than five years. He is also a former member of the Utah Geographic Information Council. Interaction with peers has been beneficial to him and his organization. Information gathered through participating in the larger GIS community has helped Granberg enhance AGRC’s ability to serve its ultimate customer: the business of government and the people and organizations that it serves.